The First Asian hornet sighting for the UK in 2019, has been reported from Guernsey, where an emerging queen was captured from hessian sacking protecting cables. This has been reported by the BBKA. The National Bee Unit confirmed a sighting of the Asian hornet in the Tetbury area of Gloucestershire in September 2016 – the first time the hornet has been discovered in the UK. The places it is most likely to be found are in southern parts of England or goods among which it could be accidentally imported [such as soil with imported pot plants, cut flowers, fruit and timber]. it is inactive over the winter. RBKA will post news on occurrence and distribution in the UK as and when it is received. One of our members was actively involved in the recent reporting from Tetbury and the latest news will be available here! 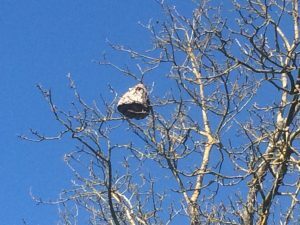 There have been nests found in Fowey and individual hornets have been spotted near Hull . Check below for the Apple and Android app links and remember the RBKA Nelson Hornet Trap if you want to monitor what’s happening! On Sunday 24th September 2017 the NBU received two photographs from a beekeeper in Woolacombe [Martyn Hocking], North Devon, of an Asian hornet. The following day, the 25th September, preliminary surveillance began in the apiary and the NBU’s Contingency Plan was activated. The local Bee Inspector monitored the apiary and initially found surveillance difficult due to the position of the colonies in the apiary. However, that morning, the Inspector managed to capture a hornet and sent the sample to the NBU in Sand Hutton for formal identification. Later that afternoon, the Inspector returned to the apiary site and a further 7 hornets were seen hawking in front of hives, but no line of sight could be ascertained, to establish a flight path back to the nest. On the 26th September, South West Region inspectors were deployed to intensify searches for Asian hornets hawking in the area. Wet, misty and murky morning weather conditions were not ideal, but the Inspectors continued to survey the original outbreak apiary and two lines of sight were established. 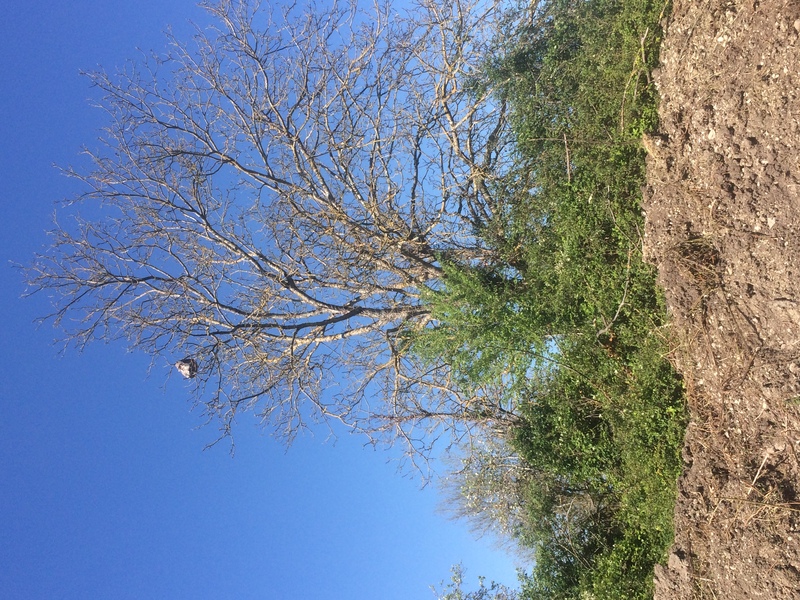 Inspectors were able to identify a second apiary site about 1km from the original outbreak, where one hornet was seen hawking for returning foraging bees. A hornet sample was taken, in order to establish if the hornets visiting the second apiary site were from the same nest and thus determine if there were multiple nests in the area. 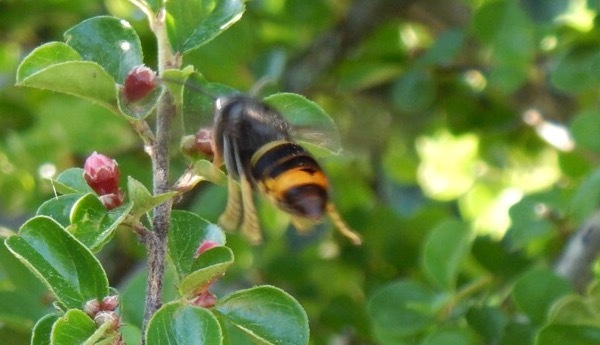 Hornets were also observed in an apiary at a further site and were seen flying in a similar line of sight. The lines of sight from both the outbreak apiary and the second apiary combined were enough for an initial triangulation to be taken and investigated. The Inspectors began investigating public footpaths and the area around where the lines of sight met at the triangulation. 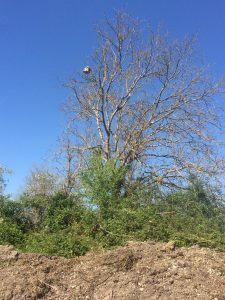 A great deal of Asian hornet activity was observed at a nearby building site and on 27th September an Asian hornet nest was discovered! 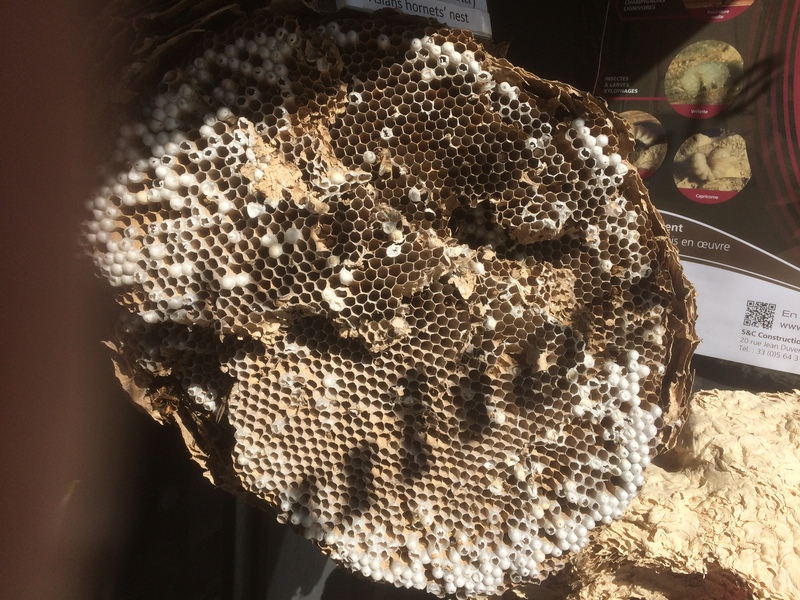 The nest was destroyed the following evening, removed and taken to the Fera lab (Sand Hutton, York) on Friday 29th Sept. Further surveillance was carried out within a 10 km zone of the nest site and no further Asian hornet activity was detected. 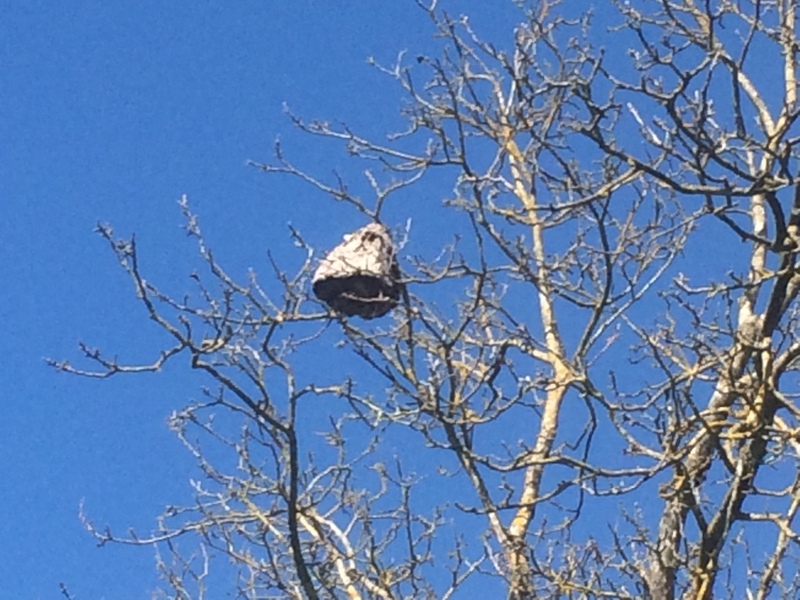 Analysis of the nest has shown that none of the adult hornets was male, indicating that the nest was detected and removed before the production of queens which would have gone into winter and then produced nests in 2018. This insect is not in Ryedale, yet…. …but it has been found in Scotland and Devon ! If you should find yourself in the Dordogne region of France, near the market town of Riberac, there is every chance you will see Asian hornets. Even if you do not, there is a pest control operation based there called allo-3D [11, Place Nationale, 24600 Riberac] that has displays of cut-through nests and a host of current information. Did you know for example, that in this part of France at least, nests have been found at ground level in old tunnels left by moles? Talk to Elodie Cornu who is a beekeeper, speaks beautiful English [and French] and has a wealth of knowledge on current management practices and control strategies. 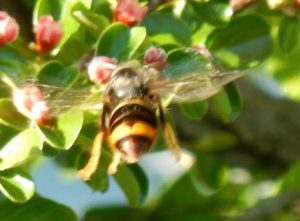 These pictures were taken on cotoneaster flowers at Mensignac in the Dordogne, where 4-5 hornets were seen feeding on a regular basis. A specimen of the European hornet was also captured at the same site. A new App is now available. It has been developed by, and for, the Department for Environment, Food & Rural Affairs [DEFRA]. It is designed to be easy to use and allows fast reporting of possible Asian hornet sightings. 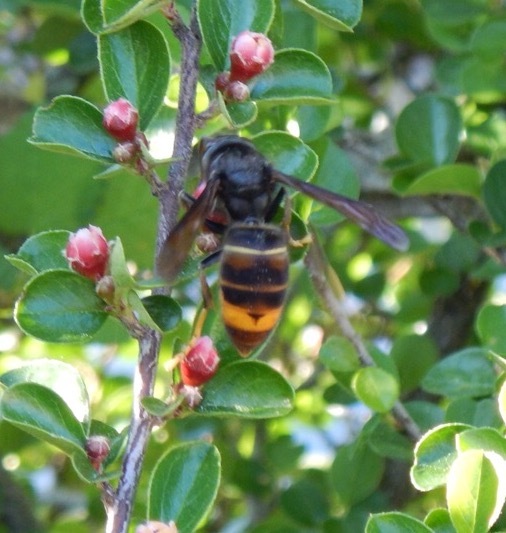 The interactive app, developed by the Great Britain Non-native Species Secretariat and the Centre for Ecology and Hydrology, will also make it easier for people to judge whether an insect may actually be an Asian hornet; with pictures available of other insects that it could be confused with and helpful information about their size, appearance and the times of year they are most likely to be spotted. Martin Smith, Public Affairs Manager at the British Beekeepers’ Association, said: This new app launched today by DEFRA is a welcome addition to current reporting methods that have enabled beekeepers and members of the public to report possible sightings. 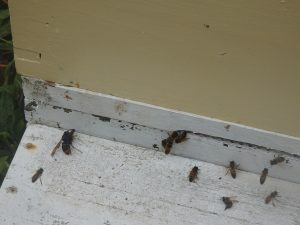 The key to containment is catching outbreaks as early as possible and allowing fast tracking of the insects back to their nest. We will certainly be encouraging all our 25,000 beekeepers to install the app and use it if they see what might be an Asian hornet near their hives. The Asian Hornet Watch app is available to download from the Apple and Android app stores. Trapping is an option, and RBKA has prepared instructions for a sentinel trap based on a publication provided by the National Bee Unit. The RBKA Nelson Trap is a simplified, and we believe easier to construct, trap. It is uses cheap and readily available materials. This trap reduces damage to other species and is specific for the Asian Hornet. Instructions may be downloaded [RBKA Nelson Trap] or viewed online. Do NOT under ANY CIRCUMSTANCES disturb or provoke an active hornets’ nest [as if you need telling!!]. Please note that at the end of these videos, YouTube will follow-up with the next related video which may not be about Vespa velutina! To return to RBKA site press ESC.